What’s the handbag that would give you life—if only you could find it? Agnes Baddoo answered that question for herself, and it became a business. Formerly a fashion stylist for Elle magazine, Baddoo cut her teeth on the international fashion circuit of New York, London and Paris in the ’90s. When The Glow Up caught up with the designer over the phone from her headquarters in Los Angeles, she was celebrating the fifth anniversary of her eponymous unisex line of handmade leather bags, now sold by some of the most exclusive retailers in the world. Baddoo became a designer out of necessity. She had taken a favorite bag that once belonged to her mother to the shoemaker so many times, they had to change the proportion and move the handles and closures until they couldn’t do it anymore. Undeterred, “I set out to find someone who could make the bag for me,” she says. Wanting a single bag made to replace a favorite is one thing; starting a business is quite another—especially as a fashion insider who both knows the fierce competition in the luxury sector and how easily an original idea can be copied into oblivion. How to survive as a fledgling designer in the world of fast-fashion insta-rip-offs? Baddoo got a handle on her business when she became part of the design collective at the Echo Park Craft Fair in Los Angeles. Some 5,000 people a year attend the biannual fair, featuring 200 highly curated vendors. The two-day affair draws discerning design professionals and luxury retailers from as far away as Tokyo. Launched at the fair in 2013, the 10 bags she had produced sold in two hours, with orders placed for more. “[T]hat allowed me to own my own business,” Baddoo says. Each bag retails between $400 and $600 and takes an artisan three days to cut and assemble by hand the 10 panels that make up each bag. Baddoo’s top-selling bag is Sac 1, the first model she ever made. 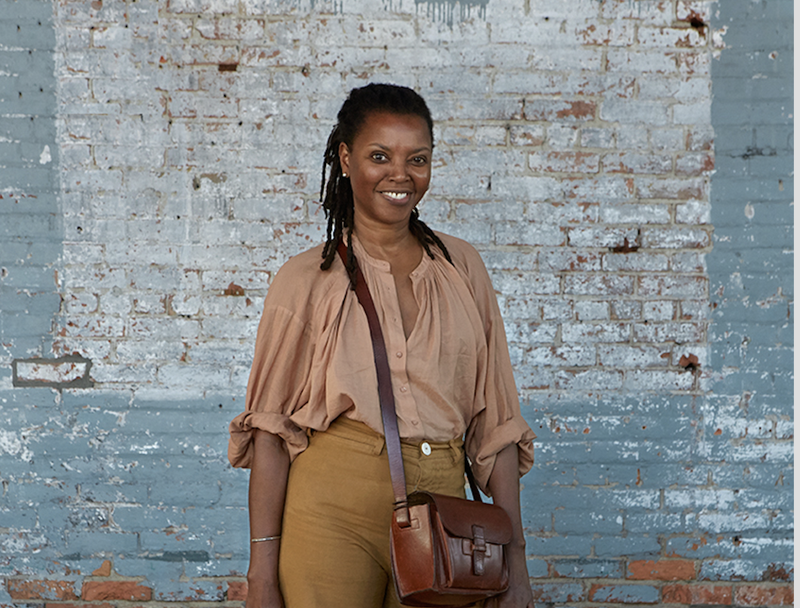 Belt Sac 1, which can be worn as a fanny pack or a cross-body bag, is inching up to become a top seller. Baddoo makes five styles and produces about 100 in each color, which are often sold out on the site. Baddoo makes what you could arguably call the “anti-it” bag. “What I like about fashion is the way that well-made things make people feel,” she says. Baddoo is someone who thrives on continuity and a personal connection to the places where she lives and does business. She’s a bicoastal resident who divides her time between the “classic neighborhoods” of both Hollywood and New York City’s Upper West Side that resist developers and chain stores, and is steadily growing roots in Los Angeles. “It’s important to me to own a business and manufacture where I live and pay taxes,” she says. Though both output and profits could increase tenfold literally overnight if Baddoo were to outsource her production to Asian factories, the six-person production team of artisans who make all of her bags by hand in Los Angeles is a precious resource—and one she sees dwindling before her eyes. “When I go to look for people who make things, they are all of an age, and I don’t see young people coming to look for those kinds of jobs or learn the craft,” she says. What’s next? Baddoo has just finished writing a business plan projecting the next five years of her business, including a storefront “artelier,” combining retail and manufacturing under one roof.